Available in a clean white finish with an LED display and adjustable feet, the AEG L6FBI861N will suit any home. An 8 kg capacity gives this washing machine plenty of room for your laundry, while a powerful 1600 rpm spin speed gets more water out of your clothes. With an energy efficiency rating of A+++, this appliance delivers brilliant results and keeps running costs down. AEG’s L6FBI861N comes with a range of programmes to can treat a variety of fabrics and stains. ProSense technology also features in this washing machine. 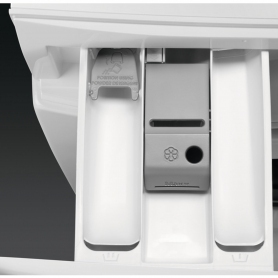 This clever AEG feature uses sensors to automatically weigh each load of laundry. 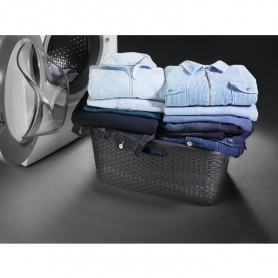 Washing times are then precisely tailored in order to give your clothes the best possible treatment. Enjoy clothes that feel fresh and like new, while saving energy in the process. The L6FBI861N has also been awarded Woolmark Apparel Care Blue certification. Woolmark’s Blue label means that woollen clothes marked as ‘hand wash only’ can be washed safely in this appliance. Not only that, but this model’s wool programme features a cool down at the end of the cycle to prevent chill-shock and shrinkage. Powered by an inverter motor, this AEG washing machine features significantly reduced vibration. The result is an appliance with improved performance, minimal noise and a longer life. AEG’s signature ProTex drum design also features on the L6FBI861N, gently handling clothes to prevent wear over time. 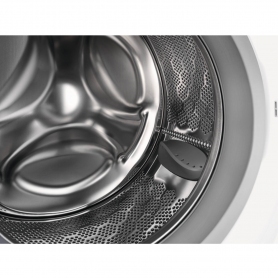 Water jets lift your laundry, protecting garments as they wash. With more holes than other models, the ProTex drum allows for better drainage and reduces the stretching of fabric. 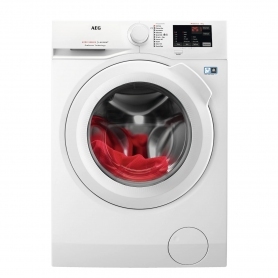 The Delay Start function on this appliance means you can start a laundry cycle whenever works for you – simply set a time and the AEG L6FBI861N will run automatically. Have your laundry ready the moment you walk through the door. 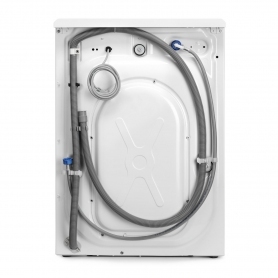 A generously sized porthole on the L6FBI861N makes it easier to add and remove laundry. This is perfect for larger loads, allowing you to fit more in at once. You’ll also find a Pause/Add function on the L6FBI861N, so you can go back and add any forgotten garments to your laundry cycle. 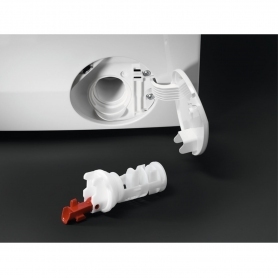 A child safety lock features on this model, allowing you to lock the door and prevent any little hands from interfering. This washing machine also uses the Aqua Control function, which monitors water levels inside the appliance to immediately detect any leakages. Offering powerful cleaning that’s gentle on laundry, AEG’s L6FBI861N is packed with features to get the best out of your favourite outfits. Order yours today.